The Galápagos Islands are an absolutely magical place. Few other places in the world have played such a huge role in our understanding of the natural world, and few other ecosystems in this world are as unique. You will be hard pressed to find another place on this planet where you can see species evolve in a single human lifetime. Because the Galápagos is such a unique and wonderful place, it sees an influx of tourists every year who are anxious to witness this captivating ecosystem for themselves. What many of these people don’t realize before starting to book their trip is how much logistics are involved in visiting the islands. When you account for these extra considerations, along with the fact that visiting the Galápagos is naturally a little tougher because it is an island chain, you can see how having the right information when planning your trip to the Galápagos can be very important. Well, fear not, because that is exactly what I am going to provide you. This is the first in many articles that I will be writing about visiting the Galápagos Islands in an effort to give you all of the information you will need to make your next trip to the islands an absolute success. In this article, I am going to lay out everything that you need to know about getting to the islands. I will lay out all of the logistics, the fees, the transportation arrangements and costs, and everything else that goes into getting to the Galápagos Islands. I will be going far more in-depth on all of the various aspects of touring the Galápagos Islands when I write my official visitor’s guide in the coming weeks, but I thought it would be helpful to also include a short summary here for you to review. At a minimum, it will make the explanations I give on the logistical planning for your trip make a little more sense. The Galápagos Islands are an island chain that is located in the Pacific Ocean, roughly 973km (or 605 miles) from the mainland of South America. The islands are officially a territory of the country of Ecuador, which sits due East of the Galápagos Islands chain. The Galápagos Islands, which were volcanically formed and continue to be formed by the island’s many active volcanoes to this day, are comprised of 21 islands, 18 of which are major islands. 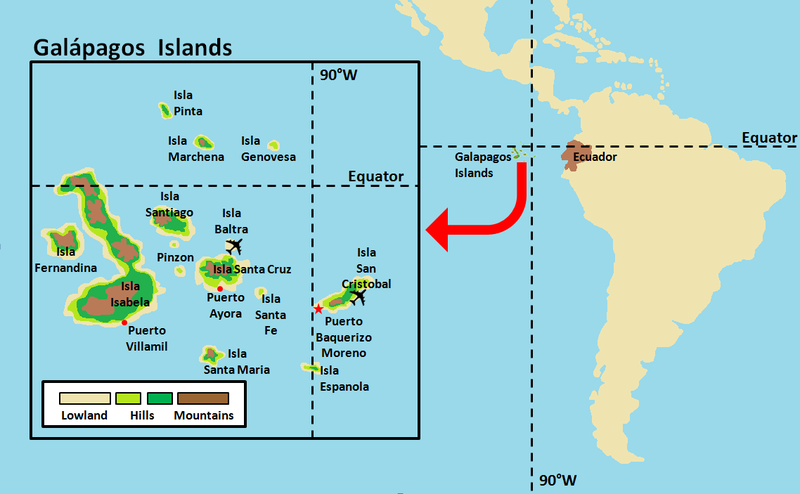 To get a sense of the distribution of some of the main islands that make up the Galápagos Islands, you can refer to the map I included below. The three islands that you will probably hear the most about when you read about the Galápagos Islands are Santa Cruz, which is the most heavily populated island in the Galápagos, San Cristobal, which is the political capital of the Galápagos Islands, and Isabela, which is the largest (and newest) island geographically in the Galápagos Islands chain. Roughly 26,000 people live in the Galápagos Islands, and most of those people live on the island of Santa Cruz. This is the economic engine of the Galápagos and the island that most people use as a jumping off point for their adventures in the islands. There is an airport that is located on Baltra Island, which is located just North of Santa Cruz, as well as on the island of San Cristobal, which is another jumping off spot for visitors to the Galápagos. Before you leave home, you are going to want to make sure that you are prepared for your visit to the Galápagos Islands. In addition to making sure you have packed everything that you will need on your trip, you are going to also want to make sure that you have all of the necessary immunizations that you will need. For more information on what to pack and which immunizations to get, please refer to the information I provided below. Because the Galápagos is an island destination, it can be very difficult to find what you need if you forget to bring something. For that reason, you will want to take special care to make sure you have everything that you need packed. To assist you in this endeavor, I have created a Galápagos Islands Packing Guide that you can reference to assist you. Before you leave for your trip to the Galápagos Islands, you need to make sure you have all of the proper vaccinations. Not only to protect yourself but to protect others. In fact, depending on where you are visiting from and whether you are making any stops before visiting Ecuador and the Galápagos, you might not even be allowed in the country without the proper vaccinations. Most specialized travel clinics will not accept insurance so you will have to pay for your travel consultation and immunizations and then request reimbursement from your insurance company later. In case you are unsure of what travel vaccinations you might need, I have compiled a list below of some of what you might expect your physician to recommend. Typhoid (either a shot, which is good for 2 years or live virus pill, which is good for 4 years). Yellow Fever (Ecuador is one of those countries that requires proof of a Yellow Fever Vaccination if you are traveling from a country that is considered high-risk – even if it is just a short stop or layover). Dukoral (gives you 3-month protection against travel diarrhea). Transderm SCōP Patch (for motion sickness) or at a minimun Dramamine pills. In order to visit the Galápagos, you will first need to get to mainland Ecuador, as you are only able to fly to the Galápagos from the Ecuadorian cities of Quito or Guayaquil. It is roughly a 2-hour flight from either city, with the flight from Quito being a little bit longer at 2 hours and 15 minutes. When we visited, we flew to Baltra Island from Guayaquil and flew back to Quito on the return trip. The two main airlines that service the Galápagos Islands are Avianca and Latin American (LATAM) Airlines. We flew both airlines on our trip and have nothing but great things to say about both airlines. We were especially pleased with Aviana Airlines, who went above and beyond to make sure that we (and our baggage) made their connection after our originating flight got delayed. When you arrive at the airport in either Quito or Guayaquil, you are going to want to make sure you take care of getting your Transit Control Document and go thru customs for the Galápagos to have your baggage checked. I outline the importance of both of these things for you below. When you arrive at the airport, you are going to want to look for the Consejo De Gobierno Del Regimen Especial de Galápagos (which translates to “Government Council of the Galápagos Special Regime”) booth. Here, you will need to pay $20 US to get your transit control document (shown above). You will be required to tell them when you plan on entering and leaving the Galápagos islands. Make sure you do this at the airport as they will let you board the plane and fly to the Galápagos without the Transit Control Document, but they will not let you thru Immigration and Customs at the Galápagos without this document. You can get one when you arrive at the Galápagos, but the process is far more tedious there. Another thing that I highly recommend that you do at the airport before flying to the Galápagos is to have your baggage inspected. Again, you don’t have to do this before you fly to the Galápagos, but it is much easier to do it before you fly than wait until you get there. There are certain things that you cannot bring into the Galápagos that are above-and-beyond what is prohibited in Ecuador in general. This includes any agricultural products, plastic bags, and hiking and camping equipment. I go into this in more detail when I discuss the Customs Declaration Form for the Galápagos in the next section. Once your bags have been inspected, they use a special green zip tie to seal your bags closed. If you are going to need anything out of your bags before you go thru customs in the Galápagos, make sure you get those things out before having this inspection done. If you cut off the zip tie, you will need to have your bags re-inspected when you arrive. Once in the airplane and on your way to the Galápagos, there are a few additional things you need to be prepared for. You will need to be prepared to fill out a customs affidavit for the Galápagos and you will need to be prepared for the airline to spray your carry-on luggage within the overhead bins with a non-toxic insecticide. Before you land in the Galápagos, the flight crew will pass out a customs affidavit form for the Galápagos Islands. This affidavit will ask you to certify that you aren’t bringing any banned materials into the islands. That you aren’t bringing any processed, fresh or cooked foods, plants, flowers, fruits, seeds, nuts, bulbs, live animals, wood, handcrafts of plant or animal origin, biological products, soil, sand, rocks or minerals. You haven’t been where there are concentrations of domestic or wild animals in the last 72 hours (farms, zoos, or protected areas)? If you have any of these items in your luggage, you will need to dispose of them before you disembark the plane. This is one of the reasons it is beneficial to go thru your bag inspection prior to boarding your plane for the Galápagos. You can be assured that you don’t have anything in your luggage that isn’t allowed onto the islands. Another thing you will want to be prepared for during your flight is for the flight crew to spray the overhead bins of the plane with an insecticide. The Galápagos Islands are very serious about preventing any invasive plants, insects, or animals from making it onto the islands, and this includes insects that might be stowaways in your luggage. The spray is non-toxic and thus isn’t harmful to humans. When you land in the Galápagos, you will need to go thru customs and immigration. The first thing you will be asked to produce when you speak to the customs and immigration agents is the Transit Control Document that you were given before you boarded your flight to the Galápagos. Remember, this is a document that you will need to get at the airport and it will cost you $20 US. This isn’t something that they won’t let you board the airplane without, so make sure you get yours before you board the plane. If not, you will need to pay the $20 US when you arrive at the Galápagos and that will require waiting in multiple lines. Once you show them your Transit Control Document, you will be asked to pay the $100 US Galápagos Islands entrance tax. You will need to pay this tax to enter the protected area that is the Galápagos Islands. As soon as your fee has been paid, you will need to run your bags thru an x-ray machine to make sure you don’t have any harmful items in your luggage. Once that is complete, you are free to exit the airport and begin your visit to the Galápagos. Important Note: The fees that you pay will need to be paid in cash (in US dollars). They do not accept debit or credit cards for these payments, so make sure you have plenty of cash on hand when you arrive in the Galápagos. There is an ATM machine in the Baltra Airport, but it is a hassle to get to and will prolong your immigration and customs process if you don’t have cash handy when you land. While San Cristobal is the political capital of the Galápagos Islands, it isn’t the most populated island in the Galápagos. That would be Santa Cruz Island. Because of this, most people choose to use Santa Cruz as their jumping off point for touring the Galápagos rather than San Cristobal Island. However, San Cristobal does have an airport and some people do begin their trips on this island because they have other business to do on the island or tours on the island. To get from San Cristobal Island to Santa Cruz Island, you will need to take a speedboat. For your convenience, I have included the schedule for the public speedboat service below for you to review. Please note, it is no mistake that the boats that travel in the morning take less time to reach their destination than the boats that travel in the afternoon. In the Galápagos, the ocean waters are calmer in the mornings and choppier in the afternoons. For this reason, it takes less time to travel by boat in the mornings versus in the afternoons. The price varies between $25-$35 US (one way) based on the season, and I would suggest that you book these tickets in advance if you are able to. You will want to make sure you have motion sickness pills with you, even if you generally don’t get motion sickness. These boat rides can be rough sometimes and it is not uncommon to have people get motion sickness on them. I brought motion sickness patches (that you place behind your ear) when I went, and I was so glad that I had them. I will include this info in my Galápagos Islands Packing List when I create it. Please note, if you are planning on traveling from San Cristobal Island to Isabela Island, you will need to first travel to Santa Cruz Island and then on to Isabela Island. You will need to take the morning boat from San Cristobal to Santa Cruz and then wait for the afternoon boat from Santa Cruz to Isabela. This is another big reason why people use Santa Cruz as a jumping off spot rather than San Cristobal as it is easier to get around from Santa Cruz than it is from San Cristobal. 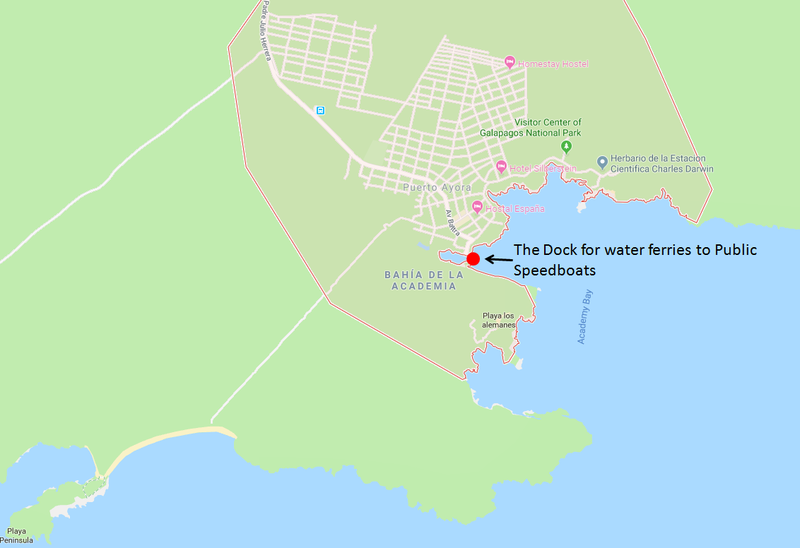 To get to the speedboat, you will need to take a water taxi from the dock in Puerto Baquerizo Moreno to the boats that are waiting out in the harbor. These water taxis will also transport your luggage with you to the speedboat. The price per person for the water taxi is $0.50 US and will need to be paid upon boarding the boat. Before they will let you board one of the water taxis, you will need to have your baggage inspected for prohibited items. This is where the baggage inspection before you left mainland Ecuador will come in handy. Any bags that have the green tie wrap on them do not need to be inspected at the docks. This can save you valuable time at the docks. If you would like to use Santa Cruz Island as your jumping off point for exploring the Galápagos Islands, you are going to want to book a flight that flies into Baltra Island. Baltra Island is the small island just North of Santa Cruz Island and serves as the airport for Santa Cruz. As I mentioned previously, this is the most common avenue for entering the Galápagos Islands. 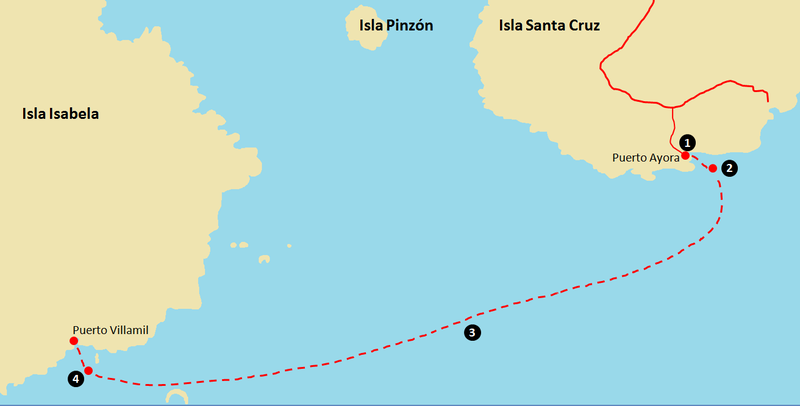 Most people choose to fly into Baltra and use Santa Cruz Island as their jumping off point because Santa Cruz Island is the most populated island in the Galápagos, most of the boat tours in the Galápagos originate from Santa Cruz, and it is the central hub between San Cristobal and Isabela Islands. After you have landed on Baltra Island and gone thru immigration and customs, you will need to take a short bus ride from the airport to the Baltra Ferry Terminal. The fee for the bus ride is $10 and can be purchased right outside of the airport. They will load your baggage onto the bus and then take the baggage off the bus to be loaded onto one of the water ferries. Please note that they do their best to get your baggage onto the same water ferry as you, but sometimes this is difficult and your bags may make it onto a different water ferry. Do not be concerned as the bags will be only shortly behind you if this happens. If you have valuables that you are concerned about, then I would keep those bags on you when you board the bus. The cost of the water ferry is included in the bus ticket so you won’t need to worry about paying for the water ferry, but you will need to arrange a taxi once you disembark the water ferry to take you to Peurto Ayora. I would expect to pay between $10-$20 US for the taxi ride to Puerto Ayora, depending on what season you are visiting. If you are visiting the Galápagos with a tour group, most tour operators will have this transportation arranged for you. Chances are, you are going to want to visit Isabela Island during your trip to the Galápagos Islands. Isabela Island is the biggest island in the Galápagos, and it is where you will find a lot of the snorkeling and wildlife tours, it is where the Giant Tortoise Breeding Facility is located, and it is home to some of the most active volcanoes in the Galápagos. Should you decide that you would like to visit Isabela Island, I am going to give you all of the information you need to know about how to get there in this section of this article. I include schedules, costs, and important information that you need to be aware of. In order to visit Isabela Island, you will need to get to Santa Cruz Island first. There are no public speedboats that take you to Isabela Island from any island other than Santa Cruz. If you are interested in seeing the schedule for public speedboats, I have included the schedule for you again below. You should expect to pay between $25-$35 US per person for the boat ride to Isabela Island. I would suggest that you book these tickets in advance if you are able to. In order to get to the public speedboats, you will need to go to the public dock in Puerto Ayora and take a water taxi out to the speedboats. You can expect to pay $0.50 per person for the water taxi ride. Again, you will want to make sure you have motion sickness pills with you, even if you generally don’t get motion sickness. These boat rides can be rough sometimes and it is not uncommon to have people get motion sickness on them. I brought motion sickness patches (that you place behind your ear) when I went, and I was so glad that I had them. I will include this info in my Galápagos Islands Packing List when I create it. When you arrive in Isabela, you will need to board another water taxi that will take you from the speedboat in the harbor to the dock in Puerto Villamil. You can expect to pay $1.00 per person for this taxi ride. Before you are able to leave the dock on Isabela, you must pay a $10 tax to enter the protected area on Isabela Island. When you pay the tax, you will get a card (which I have pictured above). Then, when you enter the island, they will stamp the card. You will want to hold onto this card as they will collect it when you exit the island. If it seems like there is a lot that you need to keep straight in your head when you visit the Galápagos, that is because there really is quite a bit that you need to understand. Having a good understanding of the process you will go thru when you arrive and how to transfer to the island(s) that you will be visiting is important. This is why it is a really great idea to use a tour company to visit the islands. They will work out most of the logistics for you and be there to guide you every step of the way. I will be writing more about the different tour options that are available to you when I write my Galápagos Islands Visitor Guide in the coming weeks. Before you leave mainland Ecuador, make sure you locate the Government Council of the Galápagos Special Regime booth at the airport and obtain your Transit Control Document (which will cost you $20 per person) and have your luggage inspected. Make sure you get anything you need out of your luggage before they seal it with a green tie wrap. You will want to leave this tie wrap on until they remove it in the Galápagos. Make sure you do not have any agricultural products or plastic bags in your luggage. The plastic bags are generally discouraged on the islands, even though we did run into many instances where souvenir shops were giving them out to customers. $100 US per person tax to enter the Galápagos protected area. 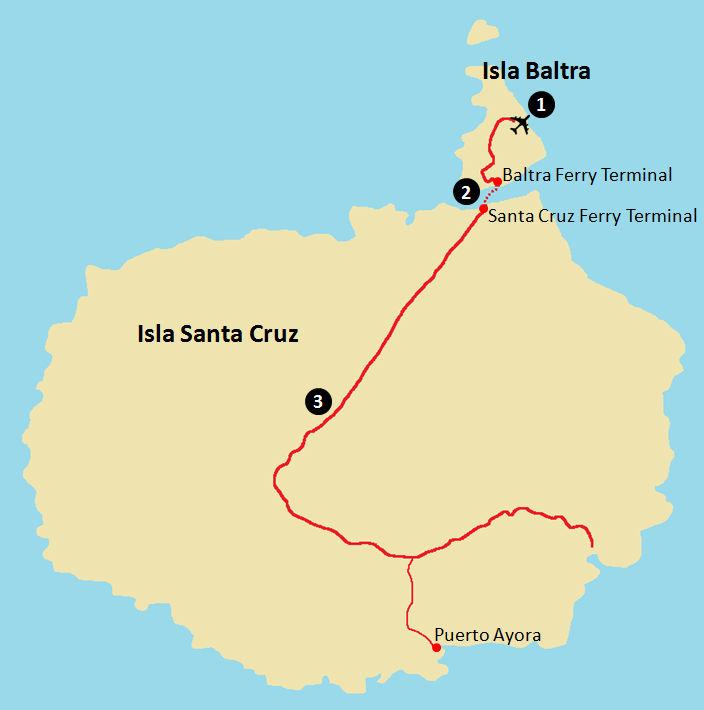 $10 US per person bus and water taxi ticket to get from Baltra Island to Santa Cruz Island. $10-$20 taxi ride to get from the Santa Cruz Ferry Terminal to Puerto Ayora. $25-$35 per person for speedboat ride from Santa Cruz to Isabela. $1.50 per person for water taxis ($0.50 in Santa Cruz and $1.00 in Isabela). $10 per person tax to enter the Isabela Island protected area. $25-$35 per person for speedboat ride from San Cristobal to Santa Cruz. $1.50 per person for water taxis ($0.50 in Santa Cruz and $1.00 in San Cristobal). You are going to want to make sure you bring something with you for motion sickness. I cannot count the number of people I saw who were really sick on the boat rides because they didn’t bring something for motion sickness. At a minimum, I would bring motion sickness pills. However, I would recommend getting the prescription motion sickness patches. They work wonderfully. Make sure you get the proper vaccinations. If you are planning on visiting any other countries in South American before arriving in Ecuador, you will need to determine if you will be required to have a Yellow Fever vaccination before being allowed to enter Ecuador. Great post and I think I am seeing something like this for the first time! You have give each and every detail simply outstanding! I think it should be like a bible for anyone visiting this place. I see a lot of restrictions and customs to be followed just to get into the island! Great work documenting each and everything Josh! What an amazing post! I wish I needed travel tips for Galapagos but it was still an awesome read! Thank you!